Are Brentford about to unveil MT today? With the evening’s football being overshadowed by Luis Suarez and his latest bite, you could be forgiven for missing the other news. I won’t repeat the column on Suarez, suffice to say that the graphic I’d put together left me having nightmares – with the miniaturised head of Russell Slade protruding from the Uruguayan’s mouth, much akin to the eponymous creature from the Alien movie. However, what I will repeat is Matthew Benham’s proclamation that Brentford should be announcing a new signing today – initials MT. Mr Benham loves a cryptic clue (see also: Mark Warburton replacing Uwe Rösler – one I still can’t work out, even knowing the answer). Of course, whichever name I suggest is sure to be wild speculation and miles off. Moreso, as Matthew has not started following any ‘MT’ on twitter (much as he did with Alan Judge or Chuba Akpom). Chelsea and Ghana’s Christian Atsu being his latest ‘follow’, although that would be a CA. Could one of these be pictured at Griffin Park today, holding a new Adidas shirt? And if BBC Manish is reading (he isn’t) I very much enjoyed your coverage of the Japan – Colombia game on BBC 3 last night. However, was there really a need to make a point that it was women aged 18-24, more than any other gender group, who watched the Croatia game? Come on Manish, this is the 21st century – who cares? Women play and watch football, too. Besides, the men were probably all busy doing the washing up and ironing. ‘Celebrating like they’d won the FA Cup…..’ – The story of Brentford’s season 2013/14 (amongst other things) is now available as a digital book. Featuring the best of the not so bad columns from the last ten months, and some new content, you can download it here for your kindle / digital device. You couldn’t make it up. With the media all set to deliver the fatal blow to England after a dismal World Cup, Luis Suarez has stolen all the headlines with his bite on Giorgio Chiellini. 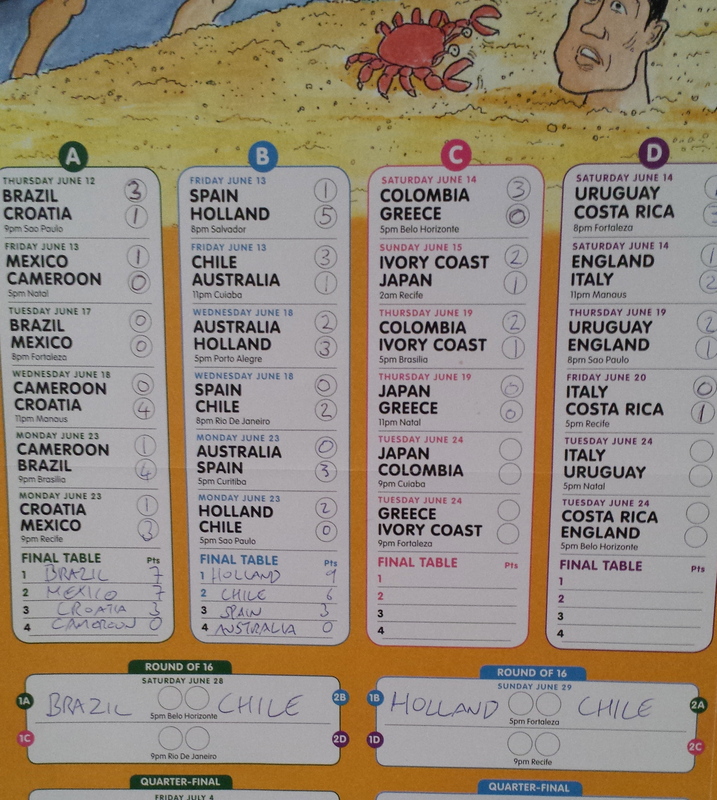 This, as Uruguay knocked Italy out in the same group stage as Roy’s Boys. Words fail to do justice to the reaction after the Uruguayan committed this most heinous of offences for the third time in his career. Robbie Savage kept repeating the line, “It’s disgraceful, disgraceful” whilst Gary Lineker did his best to remain po-faced and serious when all he wanted to do was let rip. Meanwhile on BBC 3, Manish (of football League show fame) and his guests attempted to play ‘keepie uppie’ in the studio with a tennis ball. Even Carlos Valderama had a crack in a feature that was about as far away from a mouthful of Italian shoulder blade as you could hope to get. And if it proved a distraction from England then it has very much been the same with Brentford. Matthew Benham’s late afternoon announcement of an imminent signing (initials: MT), to be revealed tomorrow, has had supporters guessing as to who it could be? Marcello Trotta? Martin Taylor? Matt Tubbs? Marcos Tébar? Or A.N.Other? Anyone who has followed Mathew on twitter will recognise his love of a cryptic clue and so this is just as likely to end up being Mr T.
Whoever it is, with Clayton rumoured to be undergoing a medical at Birmingham City at the same time as Suarez was tucking into an Italian, I’m chomping at the bit for any news. Who is the mystery MT ??? As you may have also read (I’ve not mentioned it much), I’ve released an e-book. ‘Celebrating like they’d won the FA Cup…..’ the story of Brentford’s season 2013/14 (amongst other things) is now available to download for your kindle / digital device. Featuring the best of the not so bad columns from the last ten months, you can get it here. However, I’m not the only person writing about the Bees. Greville Waterman, who you may know from the fantastic series of ‘Big Brentford book of the….70s/80s/90s’ has started his own blog. I have to say it is a thoroughly good read and you can catch up with all from bfctalk, here. The other blog site I’ve enjoyed (although seems to have gone a bit quiet in recent months) is: 101 uses for Russell Slade. Set up after being left with a surfeit of the commemorative Beesotted trophies following the Stevenage game, I’m hoping it gets going again over that painful ‘closed season’ period. And if it helps, here’s my take on the next ‘use’. 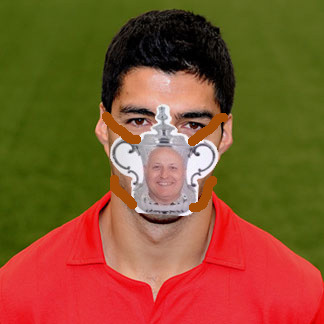 A Hannibal Lecter style facemask for Luis Suarez . Not my words but those of BBC World Cup commentator Jonathan Pearce as Lionel Messi gave Argentina the narrowest of victories over (insert your choice of patronising cliché : plucky, heroic, heartbroken, solid, minnows) Iran with a stunning last minute strike that could have been made on the Brentford training ground. Pick up the ball deep in the heart of ‘Saunders territory’, hit it with the accuracy of a Forshaw or the fake-tanned wing-wizard himself and add a dash of International class c/o Northern Ireland’s Will Grigg. It was a truly magnificent effort after a somewhat turgid encounter and, if not quite up there with Van Persie v Spain or Cahill v Netherlands, is certainly in my top three goals of the tournament. As ever, you can see the goal and the highlights on the BBC website. Elsewhere, Germany held Ghana 2-2 in the proverbial game of two halves (apologies, I really have been eating cliché for breakfast. Just need ‘park the bus’ for a full house). Four goals in a twenty-minute spell after half time made the opening 45 minutes, with both teams not so much parking the bus as struggling to get into the depot, a distant memory. The excitement was cranked up with Miroslav Klose equaling the World Cup scoring record. Age may not have diminished the 36 year old’s eye for goal but it has caught up on his gymnastic skills. His celebratory somersault fell somewhat short and ended up less Olga Korbut and more Ronnie Corbett. Getting back to Griffin Park, I’ve noticed the League table has now been updated on the BBC web page. It certainly makes great reading with Brentford already in the Championship play off spots (and Wolves currently rock bottom !). The World Cup may have come to a predictable, albeit premature, conclusion for England but it means all positive energy and thoughts can now be totally focused on the forthcoming Championship campaign. There are less than 7 (seven) weeks to go until Charlton Athletic visit to kick things off and I can’t wait. If that isn‘t a more exciting prospect than watching veteran Teutonic gymnastics, I don’t know what is.